Hannah is looking forward to qualifying as a nurse, and says her future looks bright thanks to eating disorder specialist nurse Sarah Moody. 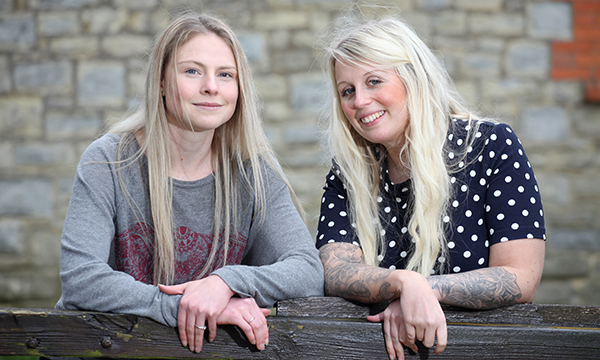 Sarah Moody (right) helped Hannah recover from her 'life-destroying illnesses'. Before nurse Sarah Moody started working with me 18 months ago, I’d been an inpatient of eating disorder services for 11 years, and had been under the care of intense mental health services since I was 13. I had been labelled as a chronic anorexic with poor prognosis and the most time I’d spent in the community during that period was five months. I had significantly deteriorated over the previous four months, with low weight and poor blood results. I was facing another inpatient admission and having to drop out of university. I longed for recovery yet continually felt misunderstood, undeserving and beyond help. When Sarah assessed me, she spent three hours getting to know me and what I wanted. She brought up the diagnosis of borderline personality disorder as a precipitating factor to my eating disorder. It was the first time I felt understood in mental health services and it opened the doors to my recovery. Sarah, who works for Somerset Care Community Services, Taunton, has gone above and beyond any nurse’s duty, with dedicated weekly appointments (and no clock watching), visiting me at university and helping me with weight gain, food acceptance and endless meal planning and exposure work. Most of all she has given me the confidence to believe I can and will recover from these life-destroying illnesses. She would reply to my sometimes page-long email reflections, challenging my disordered thoughts and rigid thinking. Sarah has helped me improve my emotional regulation, mindfulness and interpersonal effectiveness through dialectical behaviour therapy practice, allowing me to meet mine and others’ needs. She has walked alongside me every step of the way, helped me find myself again and allowed me to believe that I’m more than just a label. Now, aged 27, I have been out of hospital for months. My bloods are normal and I’m the highest weight I’ve ever been. Four years ago I was in hospital, sectioned and being fed through a nasogastric tube. My family were told that I was unlikely to survive the next few days. This year I’m planning my wedding and graduating as a nurse. Sarah is one in a million. Without her help, I would still be the sad, lonely and misunderstood young girl I once was. I still have the final hurdle but I will reach a time without disorders, free to embrace life. I hope that in my practice I can make half the difference that Sarah has to me.